As part of your tooth replacement plan, we’ll work with you to review every step of the treatment process to ensure you feel confident before starting your dental implant tooth replacement plan with our dentist in Gorham and the dentistry team at Morgan-Hill Dental Care. 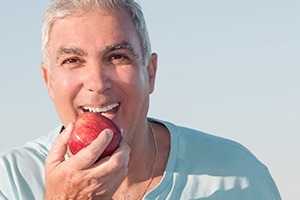 Keep reading to learn more about the dental implant tooth replacement process, and call our team whenever you’re ready to get started with a personalized tooth replacement plan. The first step in any dental treatment plan is to visit our Gorham dental office for a consultation appointment. During these visits, we’ll carefully examine your smile, capture diagnostic images, and discuss all of your treatment options. At this appointment, we’ll walk you through every step of the process, including scheduling and budget. If you decide to move forward with a dental implant supported treatment plan, we’ll begin by performing any preparatory treatments like tooth extractions and tissue grafts. Then, one or more dental implant posts will be surgically placed. The dental implant placement procedure involves making a small incision in the soft tissue. Then, the implant post is placed into the jawbone. A protective cap is attached to the dental implant posts to allow them to fuse with the supportive tissues. 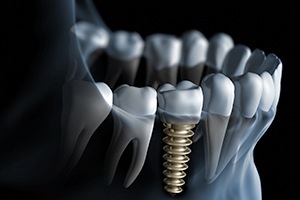 Over the next several months, the dental implants undergo the osseointegration process. This means the implant posts fuse with the bone and gum tissue, mimicking the lost roots of teeth. Once the osseointegration process is complete, you’ll return to our dental office in Gorham where we’ll place the abutment posts. These connector pieces will anchor your replacement teeth to the dental implants. 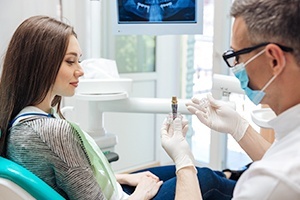 After the abutments are placed, we’ll capture bite impressions and design your dental crown, bridge, partial, or full denture. Once the dental implant posts are fully fused with a bone and soft tissue and the abutments are in place, we will capture impressions that can be used by a dental lab to craft your crown, bridge, or denture. Once the custom crafted restoration is completed by our skilled dental lab, you’ll return to our office for the final part of your dental implant tooth replacement plan, the attachment of your restoration. This process is quick and simple. Once in place, your dental implant supported restoration will flawlessly restore your smile from the roots up.